Julius Streicher was not a political powerbroker within the National Socialist movement or the Nazi state, however, his anti-Semitic publications did much to create a context for anti-Jewish violence and the oncoming Holocaust. Streicher was born in Bavaria in 1885, the son of a primary school teacher. Well educated and politically aware, Streicher also became a teacher, though he put this aside to enlist in the German army at the start of World War I. Like Hitler, Streicher won the Iron Cross for bravery, despite being a moody and sometimes erratic soldier. After the war, Streicher rebounded into right-wing political groups, including the Freikorps and German Democratic Party. But Streicher was obsessed with anti-Semitic theories that were too radical even for these groups. Finding himself on the outer, in 1919 Streicher tried starting his own anti-Semitic group, Deutsch-Soziale Partei, but had little success. In the same year he met Adolf Hitler, with whom Streicher became close friends. By 1921 Streicher had joined Hitler in the NSDAP, finding the National Socialists more amenable to his conspiratorial rants about Jews, Bolsheviks and foreigners. Through the 1920s Streicher rose through NSDAP ranks while continuing his work as a teacher. In 1925 he was appointed the Nazi Gauleiter (provincial leader) of Nuremberg and Franconia. This role gave him the authority to instigate and unleash several anti-Jewish campaigns, including boycotts, assaults on property and harassment of Jewish businessmen. Streicher was most at home as a tub-thumping public speaker, bellowing about the Jews and their “shadowy war” against ordinary Germans. But he is best known as the publisher and driving force behind Der Sturmer, an anti-Jewish scandal sheet printed and sold across Germany. Each week, Der Sturmer published lewd anti-Semitic gossip, wild conspiracy theories and dark tales of ritual murder as if they were all fact. Though it was not officially sanctioned by Hitler or the Nazis, Der Sturmer certainly had their blessing. Streicher also combined his interests in primary teaching and propaganda by producing several anti-Semitic children’s books. Some of these books, such as Der Giftpilz (‘The Poisonous Mushroom’) were used as approved texts in Nazi-run state schools. By 1940, Streicher’s reputation as a corrupt, sadistic sexual pervert had caught up with him. He fell out of favour with the NSDAP, which removed him from positions of influence – though he continued editing and publishing Der Sturmer until weeks before the German surrender. Streicher was arrested, put on trial at Nuremberg and hanged in 1946. 1. Though not part of the Nazi elite, Julius Streicher played a leading role in circulating anti-Semitism in Germany. 2. He was active in right-wing political groups after the war, though his intense anti-Semitism was not always welcome. 3. He met Hitler in 1919 and joined the NSDAP two years later, finding it more amenable to his radical views. 4. Streicher became an NSDAP Gauleiter – but he is best known as the publisher of Der Sturmer, the hateful weekly anti-Semitic newspaper. 5. Streicher was also a producer of children’s books such as Der Giftpilz, which liked German Jews to ‘poisonous mushrooms’ that had to be carefully identified. 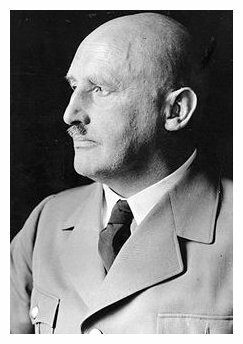 J. Llewellyn et al, “Julius Streicher”, Alpha History, accessed [today’s date], https://alphahistory.com/nazigermany/julius-streicher/.